The bodice is made of eggplant cotton and is fully lined and boned at the lacings. It laces up through professional-strength grommets with a dark green satin ribbon (ribbon colors may vary). The peasant shirt is made of black cotton and has elastic in the sleeves and neckline (gothic sleeves do not have elastic in the sleeves). The shirt length is approximately 32” or hip-length. You can choose short-sleeves (default), long-sleeves or gothic sleeves. The underskirt is made of black cotton and has an elastic waist. The skirt will come hemmed at 40" (long - will usually work for someone up to 5'10" tall) unless a specific length (less than 44") is requested. The underskirt in the photo was hemmed at 28" (approximately mid-calf on someone of average height). 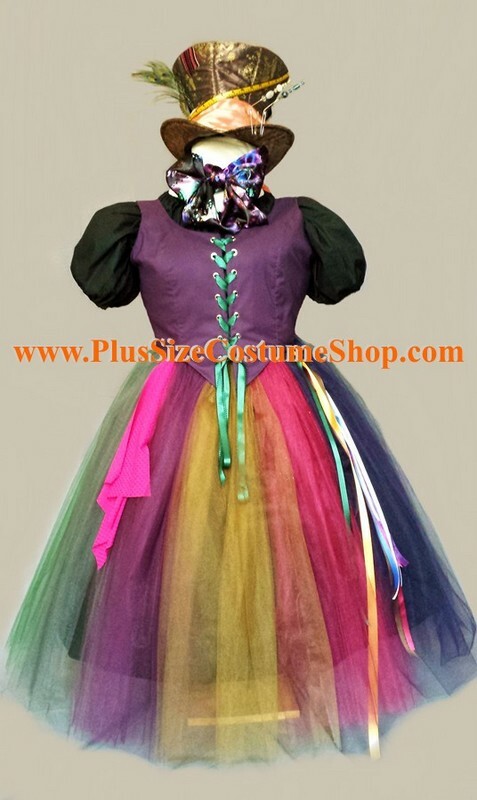 The overskirt is made of strips of multi-colored tulle. The overskirt has a drawstring and ties around the waist. The overskirt will be hemmed at 40” in length (long) unless a specific length (less than 44") is requested. The overskirt in the photo was hemmed at 36" (approximately ankle-length on someone of average height). 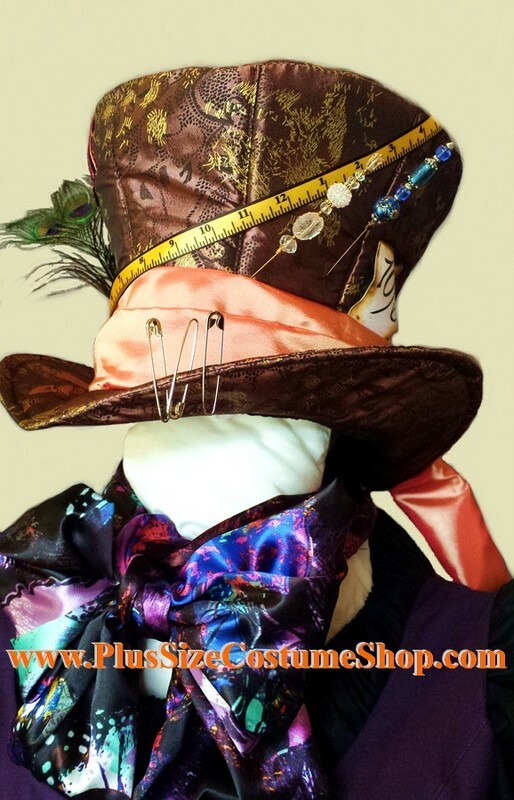 Also included is an adjustable Mad Hatter hat decorated with a peach fringed scarf, peacock feathers, two custom-made hat pins (will vary in color/size/style), measuring tape ribbon, safety pins, and a cardboard 10/6 sign. Additionally, you will receive a colorful patterned scarf (design may vary) to tie around the neck in a bow, a hot pink handkerchief, and a ribbon streamer decoration.